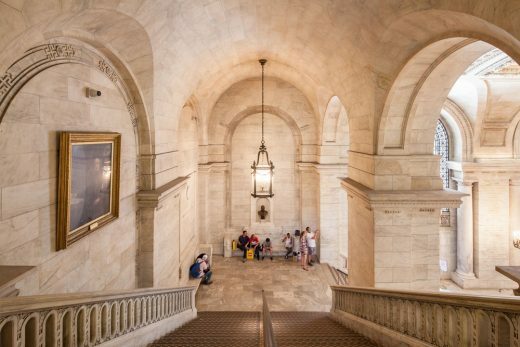 The New York Public Library has unveiled a Master Plan for its iconic Stephen A. Schwarzman Building, one of the nation’s leading research libraries, which for over a century has stood as a symbol of open and free access to information and opportunity. 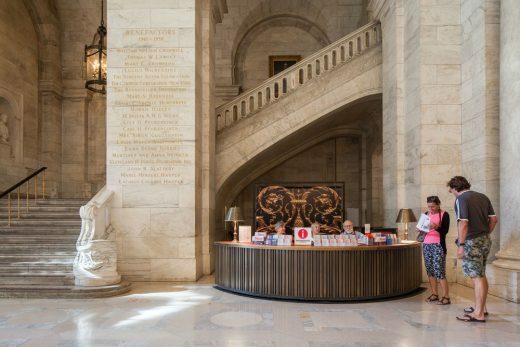 The Master Plan was developed by Dutch architecture firm and experts on library design Mecanoo, led by Francine Houben, and Beyer Blinder Belle, a New York City-based firm known for its work on historic buildings, led by Elizabeth Leber. 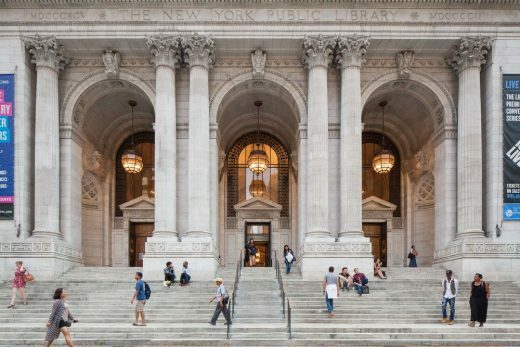 Mecanoo and Beyer Blinder Belle are also leading the renovation of Mid-Manhattan Library, the Library’s largest circulating branch, located across Fifth Avenue. 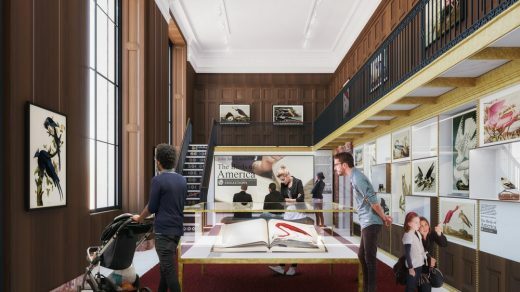 It is scheduled to reopen as the completely renovated Stavros Niarchos Foundation Library in early 2020. 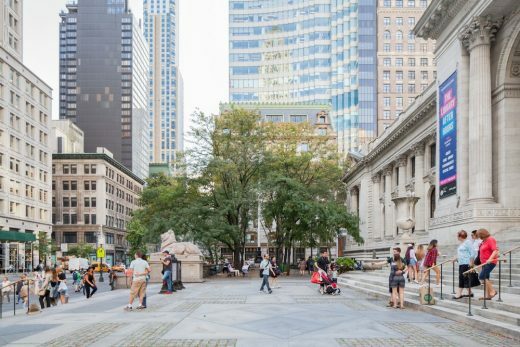 The Stephen A. Schwarzman Building Master Plan calls for future investment beginning in 2018 and continuing through 2021. Work will be done in two phases utilizing private funds. 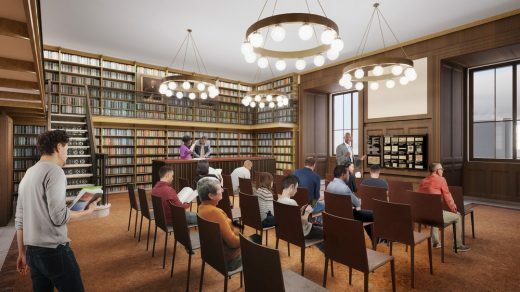 These elements will prepare the library for the future while maintaining the building’s architectural integrity and complementing existing historic spaces such as the landmarked Rose Main Reading Room, the Maps, Periodicals, and Genealogy reading rooms, and Astor Hall. 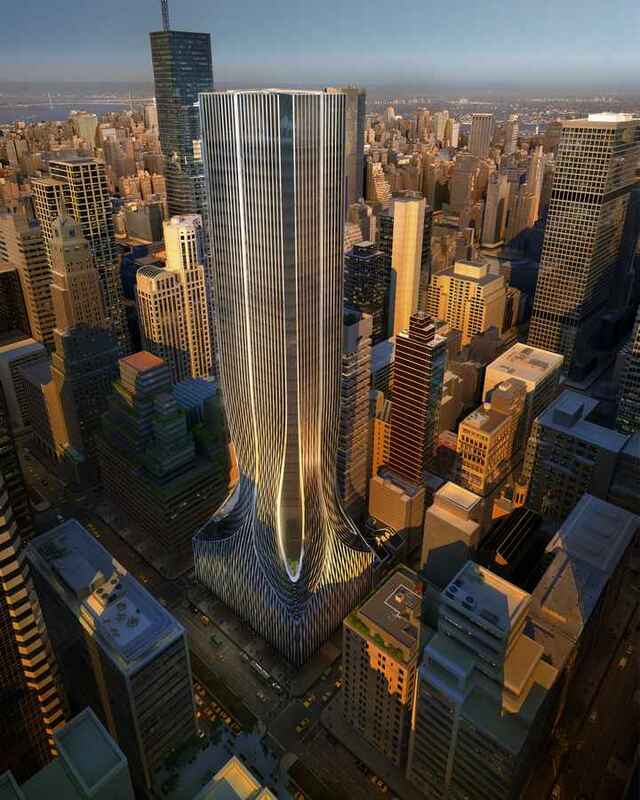 Mecanoo and Beyer Blinder Belle developed the Master Plan utilizing feedback from a variety of stakeholders, including a Trustees working group, staff, researchers and scholars, and members of the public via meetings, surveys, and smaller group discussions. 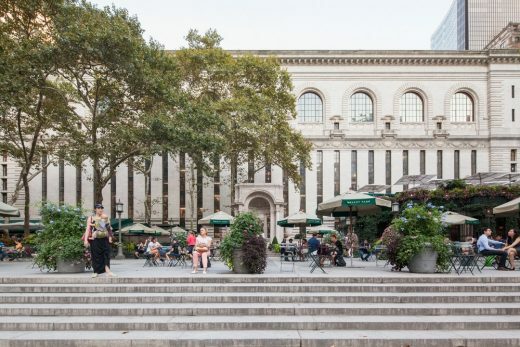 A public presentation on the master plan will be held on Monday, November 20 at 5 PM in the Schwarzman Building’s Celeste Auditorium. 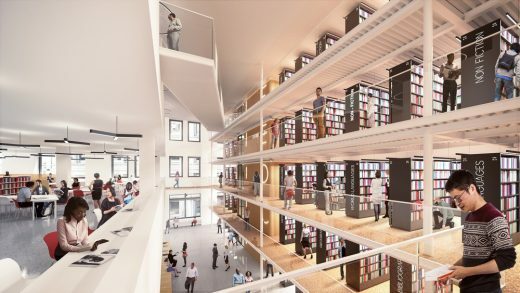 While the Master Plan does not include a definitive plan for the central stacks—seven floors of shelving built with the library in 1911—the Library also announced at the Board meeting that it has commissioned Mecanoo and Beyer Blinder Belle to do a study examining possibilities for the 175,000-square-foot space. 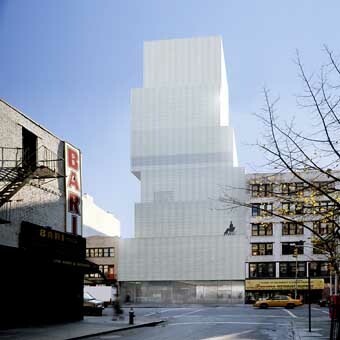 The stacks are currently housing circulating books while Mid-Manhattan Library is closed for renovation, but are no longer fit to hold research materials as originally intended for preservation reasons: the space lets in natural light and does not meet acceptable standards for temperature, humidity, and fire safety. 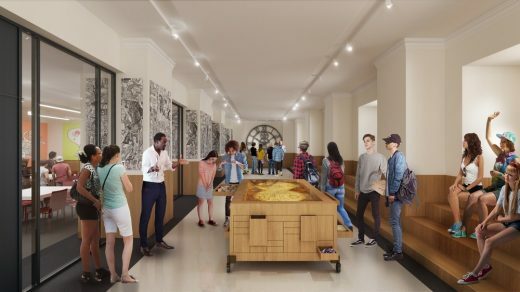 The purpose of the study is to evaluate the current state of the stacks, and then—with input from a broad range of stakeholders, including staff, architects, and a group of non-Library advisors and planners—to identify a series of potential options for the space. Once those possible scenarios are identified, the public will have the opportunity to provide feedback. 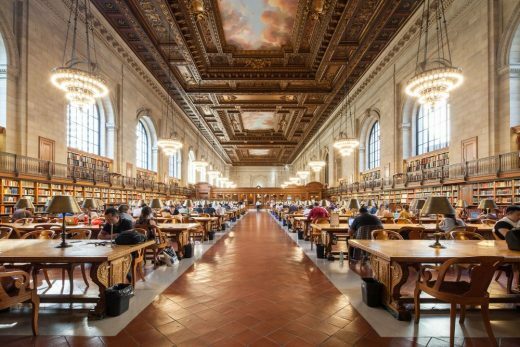 •	The restoration of the Rose Main Reading Room ceilings and the Bill Blass Public Catalog Room ceiling and murals. Both of these spaces were landmarked this year. 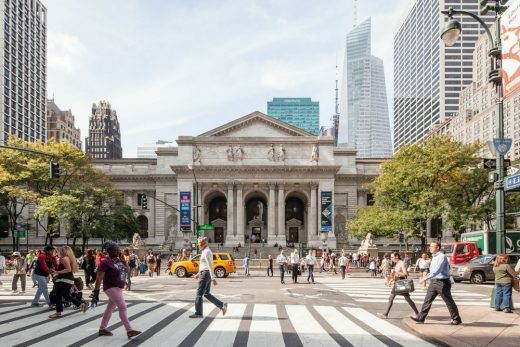 The New York Public Library serves more than 18 million patrons who come through its doors annually and millions more around the globe who use its resources at www.nypl.org. 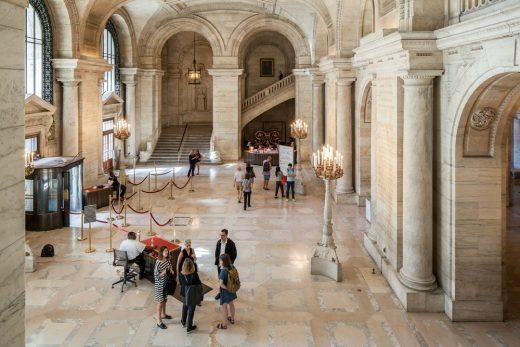 To offer this wide array of free programming, The New York Public Library relies on both public and private funding. 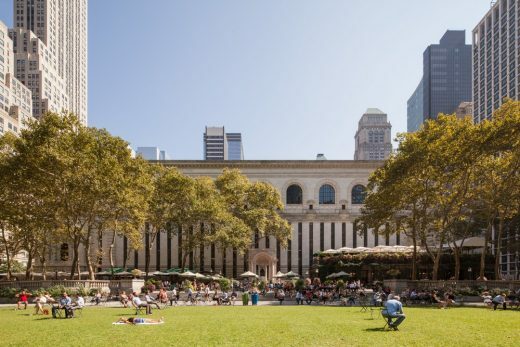 Learn more about how to support the Library at nypl.org/support. 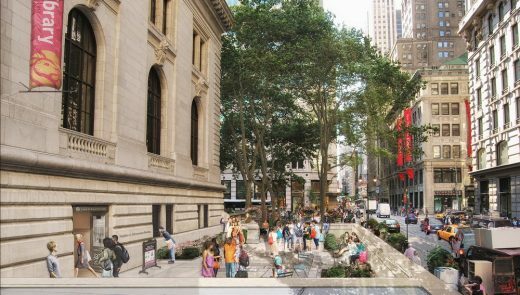 In a striking about-face, the New York Public Library has abandoned its much-disputed renovation plan to turn part of its research flagship on Fifth Avenue at 42nd Street into a circulating library and instead will refurbish the nearby Mid-Manhattan Library, several library trustees sa, m reports the New York Times.